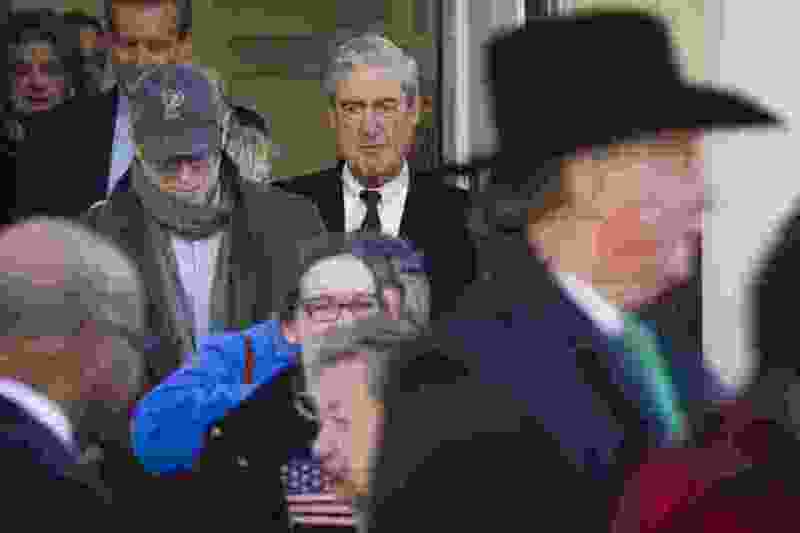 (AP Photo/Cliff Owen) Special Counsel Robert Mueller exits St. John's Episcopal Church after attending services, across from the White House, in Washington, Sunday, March 24, 2019. Mueller closed his long and contentious Russia investigation with no new charges, ending the probe that has cast a dark shadow over Donald Trump's presidency. Utah’s senators and congressmen on Sunday reacted positively to a summary of special counsel Robert Mueller’s long-awaited investigative report into President Donald Trump’s campaign and Russian interference in the 2016 election, released by the attorney general. Rep. Chris Stewart was the most aggressive in using the determination of no collusion as a vindication for Trump. On Twitter, he called Sunday a “great day for America.” Stewart has long said that there was no evidence to support accusations that the president colluded with the Russian effort to meddle in the U.S. election. As a member of the House Intelligence Committee, Stewart has been the Utah member of Congress most involved in this controversy that has hung over Trump for nearly his entire presidency. The House committee also investigated, and Republican leaders announced a year ago that they found no evidence that Trump helped the Russians. BREAKING NEWS: No American conspired with Russia to alter our elections. A great day for America. Far too many Democrats and members of the media claimed to have evidence of collusion. They should apologize to those they have falsley accused and the American people for creating this political crisis. Sen. Mitt Romney called the four-page report released by Attorney General William Barr “good news." “It is now time for the country to move forward,” Romney wrote. It is good news that the Special Counsel has concluded that neither the President nor his campaign colluded with the Russian government. It is now time for the country to move forward. Utah’s lone Democrat in Congress, Rep. Ben McAdams, again called for the entire Mueller report to be made public. But McAdams also offered criteria by which he and Congress would “move on” after receiving the report. “I continue to support full public transparency and disclosure of the Mueller report to the fullest extent allowed by law,” McAdams said in a statement to The Salt Lake Tribune. “I have always maintained that all sides should withhold judgment until the independent investigation has concluded and the results reviewed. 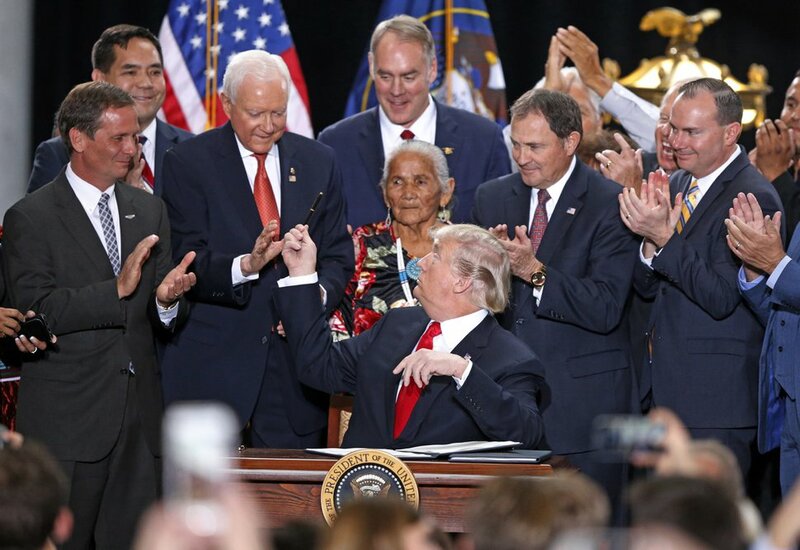 (Associated Press file photo | Rick Bowmer) President Donald Trump, center, hands a pen to Sen. Orrin Hatch, R-Utah, on Dec. 4, 2017, after signing a proclamation to shrink the size of Bears Ears and Grand Staircase Escalante national monuments at the Utah State Capitol in Salt Lake City. Rep. Rob Bishop said he was “heartened” by Mueller’s key findings. Bishop then, too, focused on trying to put the special counsel’s inquiry behind the country. Curtis then thanked Muller and his team. While Barr’s summary said Mueller found no evidence of collusion between the Trump campaign and Russia, Barr also wrote that Mueller came to no conclusion about whether Trump obstructed justice. The Utah Democratic Party, in a tweet, highlighted that last point. “This also doesn’t change the fact that Russia did actively work to alter the outcome of our elections in favor of Trump & that the American people deserve the full report,” the tweet from the Utah Democratic Party added. Ten days ago, the House voted 420 to 0 to urge the full release of the Mueller report, a move supported by Stewart, McAdams, Bishop and Curtis. Sen. Lindsey Graham, R-S.C., a Trump ally, blocked the resolution from coming up in the Senate.